Conflicting beauty and duality of the heart are represented by this piece called Coeur Sauvage; French for savage heart. 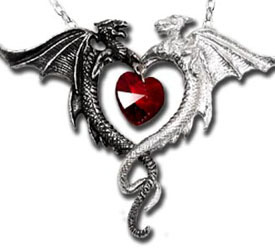 Wonderfully detailed dragons, one representing the dark adn the other the light, encircle a crimson crystal heart. The pendant measures about 2.25" x 3". Comes complete on an attached lobster-claw clasp chain of about 21" in lenght. Made in the United Kingdom.